Things have been anything but dull here lately. I'm sure all of you can say the same? Thanksgiving's coming, then Christmas. School projects are ramping up. The weather is cooling down and the days are glorious, so the critters are feeling their oats, all frisky like. Windows are open and warm bread in the morning hits the spot! 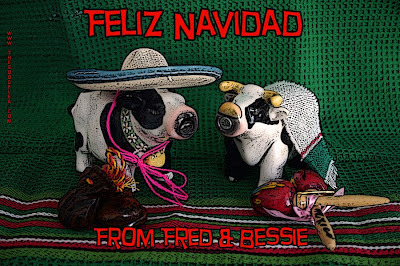 Aren't my Fred & Bessie the cutest things? Snooty was wonderful, taking us back down memory lane, with photos and tales of their visit to her home. Tales of their incarceration. Daryl, On the M104, is actually giving away some F&B right now. Go enter! Last month they helped me christen my birthday gift to myself! On Freecycle (I squishy heart Freecycle), someone offered a 1903 Singer treadle foot machine. I must have been the first respondent, because it came home with ME!!! Lookit! Isn't it loverly? I've begun lemon oiling the dry wood. A friend has offered to help me repair the treadle. Woohoo! I might, though, until spring, use it as an end table (covered with a pretty cloth, of course). Gotta scoot. The day's awaitin'! oh i love the sewing machine. I love antiques!!! Popping by from the SSS list! Happy Weekend! THAT is cool. I'd give anything to know how to use one . . . old, new, anything . .. Hold your socks on.... I made a quilt with one of those machines! Yep, a long time ago in a land far away, I too collected antiques, this was one of them. *sigh*, the down part of down sizing is down sizing. Stopping by from SSS! I think I'm going to make bread to go with dinner cuz of your bread machine below! Wow - what a great find!!! I've never had any luck getting things on freecycle, things go SO quickly!!! Amazing machine! What a great find!